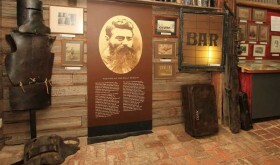 Kate’s Cottage, Gifts & Souvenirs shop is aptly named after Ned Kelly’s sister Kate. 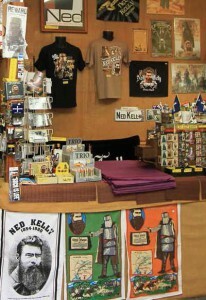 The Shop and Kelly Display is situated opposite the “Big Ned Kelly” Statue on the corner of Gladstone and Kate Streets, Glenrowan, and features a huge range of interesting and exciting Ned Kelly and Australiana gifts and souvenirs. Kate’s Cottage proudly stocks the LARGEST range of NED KELLY SOUVENIRS – T Shirts, Singlets, T Towels, Stubby holders/Coolers, Videos, CDs, Postcards, Posters, Shot glasses, Beer Glasses, Bandanas, Playing cards, Stickers, Cloth Badges, Hat Pins, Tin signs, Caps, Buckles, New & Second hand rare books, Statues/Figurines, Helmets, Armours, Flags/Banners, Rugs, Beach towels, Spoons, Pens, Keyrings, Charms, Water Balls, Magnets, Dolls, Children’s Helmets and more! 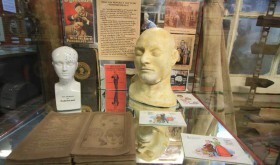 Step back in time through the back of KATE’S COTTAGE GIFTS AND SOUVENIRS SHOP and into the highly recommended NED KELLY MUSEUM and the replica of the KELLY HOMESTEAD.